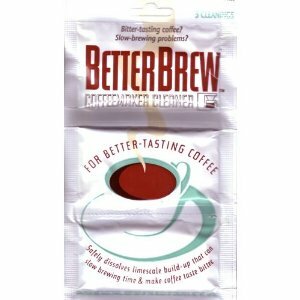 Diana has shared her review of BetterBrew Coffeemaker Cleaner. I bought my BetterBrew coffee maker cleaner off of Amazon for a really good price of about $5 for a pack of three. This will last me quite some time before I have to buy more, because I do not drink coffee everyday. I have so far used this cleaner four times (I use it after about every 25 brews, since this is what the cleaner advises) and I must say I am very happy with it. I had previously read some reviews of other coffee maker cleaners leaving either a residue or a gross smell in the coffee machine that would make the coffee taste weird. However, with BetterBrew that has not been an issue. The cleaner itself has a lemon scent and it washes away after I have let water run through the machine a couple times. It left my coffee maker (I have a Cuisinart DCC-1150 Coffee Maker, 10-Cup Thermal Programmable) nice and clean, and my coffee tastes great! I would recommend this to any and every coffee lover. Thanks for sharing your review of BetterBrew Coffeemaker Cleaner, Diana. Below I actually found a video of how to use this coffee maker cleaner, which those of you who have not used this product may find helpful. So, does anyone else use a commercial product to clean their coffee maker? If so, you can share your coffee maker cleaners review here, or read other reviews that have already been submitted. Below is a video showing the technique and steps for cleaning a coffee maker with Better Brew Coffeemaker Cleaner. Basically, the steps are quite easy to do. You first pour one packet of the coffee maker cleaner into 2 cups of tap water and stir to thoroughly dissolve the cleaner. Then, you pour this solution into your coffee maker reservoir and turn the machine on. Let it brew 1 of the 2 cups, and then turn the machine off and let it sit for 10 minutes. Next, turn the machine back on and let it brew the second cup. The Better Brew Coffeemaker Cleaner will remove hard water build up (referred to in the video as decalcifying) in your coffee maker. This will help it run better and keep it from becoming clogged up. After the 2 cups of Better Brew have been run through the machine the next step in cleaning a coffee maker is to rinse out all of the coffee maker cleaner, so you don't drink it with your next pot of coffee. Therefore, you then just fill the carafe full of tap water and run the coffee maker with the clean water through the cycle 2-3 more times before brewing your next cup of coffee in your machine. Have you used Better Brew Coffeemaker Cleaner? If so, please share how it worked for you in the comments. In addition, you can share how this cleaner, or any other coffee maker cleaner worked for you by sharing your own review. You can share your coffee maker cleaners review here, telling me what cleaner you use, and why. In addition, you can share your tips for how to clean coffee maker here, or read other tips already submitted.